South Africa, which hosts about 90 percent of the world’s rhinoceros population, should consider lifting a domestic ban on trade in the animals’ horns, authorizing commercial farming and trading the horn on the Johannesburg bourse, a Department of Environmental Affairs report showed. The steps were proposed as part of an effort to halt poaching that is threatening eventual extinction for the animals. At least 514 out of a national population, that stood at 20,711 in 2010, have been poached this year, the department said in the report, which was released by e-mail today. Most of rest of the global population is spread across sub-Saharan Africa with the next biggest concentration being in Namibia. A similar argument has been mounted about elephant ivory with Southern African nations including South Africa, Zimbabwe and Botswana advocating legal trade in the product while Kenya and other countries oppose it. South Africa should “consider opening a rhino horn trading bourse possibly linked to the JSE,” the department said, referring to Africa’s biggest stock and bond exchange. The surge in poaching comes even after the government deployed the army in the Kruger National Park, its biggest protected wildlife area, and has stepped up arrests of poachers. They target South Africa for the horns, which sell for more than gold by weight in Asia where they are believed to cure cancer and boost sexual prowess. The government department also recommends asking for permission for auctions this year of rhino-horn stockpiles to help pay for anti-poaching initiatives, and to upgrade South Africa’s border with Mozambique along Kruger National Park. Czech Republic authorities seized 24 white-rhino horns and arrested 16 people yesterday in connection with wildlife trafficking, according to the International Fund for Animal Welfare. The gang posed as hunters and then applied for export-import trophies that allowed them to export the horns as personal mementos, the group said in a statement today. Most rhinos, which weigh as much as 4.5 metric tons, are killed in the Kruger National Park, an area nearly as big as Israel that borders Mozambique, with a porous border that is easily crossed by poachers wielding assault rifles. Mozambique is the world’s 20th poorest nation, according to the International Monetary Fund. More rhinos will be killed in the next two years than will be born, so those charged with saving the endangered animal are considering radical and previously unimaginable solutions. The battle to save the African rhinoceros has all the ingredients for a Hollywood thriller. There are armed baddies with good guys in hot pursuit. There is a hint of glamour. And the drama is played out against a backdrop of a beautiful, bloodstained landscape. It is a story that begins, perhaps improbably, in Vietnam soon after the turn of the 21st century. A Vietnamese official of some influence, so the story goes, lets it be known that he, or perhaps it is his wife (for the sake of the story it matters little), has been cured of cancer. The miracle cure? Rhino horn powder. With disconcerting speed, the story shifts to southern Africa, where a series of gunshots ring out across the African plains. This is followed by the hacking sound of machetes – it takes little time to dehorn a rhino because its horn consists not of bone but of keratin fibres with the density of tightly compressed hair or fingernails. The getaway begins, armed rangers give chase. Once the horn leaves the flimsy protection of the national park or game reserve, where its former owner lies bleeding to death, it may never be found. Its new owners never brought to justice. Sometimes they are caught. Sometimes they get away. Either way, another rhino is dead in a war that the bad guys seem to be winning. The story shifts again, back to Vietnam where even the prime minister is rumoured to have survived a life-threatening illness after ingesting rhino horn. More than a cure for the country’s rich and powerful, however, rhino horn has by now crossed into the mainstream. Young Vietnamese mothers have taken to keeping at hand a supply of rhino horn to treat high fevers and other childhood ailments. It is also the drug of choice for minor complaints associated more with the affluent lifestyle to which increasing numbers of Vietnamese have access; rhino horn has become a cure-all pick-me-up, a tonic, an elixir for hangovers. With this new popularity has come the essential paraphernalia common to lifestyle drugs the world over, including bowls with specially designed serrated edges for grinding rhino horn into powder. In a short space of time, rhino horn has become the latest must-have accessory for the nouveau riche. The sudden spike in Vietnamese demand, the miraculous fame of a saved official or his wife, and rhino horn’s emergence as a symbol of status all came at a time when legal stockpiles of rhino horn were at an all-time low. Demand and supply. This is the irrefutable law of economics. The rhinoceros is one of the oldest creatures on earth, one of just two survivors – the other is the elephant – of the megaherbivores that once counted dinosaurs among their number. Scientists believe rhinos have changed little in 40 million years. The rhino’s unmistakable echo of the prehistoric and the mystery that surrounds such ancient creatures – this is the animal that Marco Polo mistook for a unicorn, describing it as having the feet of an elephant, the head of a wild boar and hair like a buffalo – have always been its nemesis. As early as the first century AD, Greek traders travelled to the east, where the rhino horn powder they carried was prized as an aphrodisiac. But the rhino survived and, by the beginning of the 20th century, rhino numbers ran into the hundreds of thousands. The Roosevelts then proceeded to shoot them. Rhinos are epic creatures, gunmetal grey and the second-largest land animal on earth. Up to five metres long and weighing as much as 2700 kilograms, the white rhino, the largest of all rhino species, can live up to 50 years if left to grow old in the wild. In an example of advanced evolutionary adaptability, the black rhino will happily choose from about 220 plant species, eating more than 70 kilograms of plants a day. These impressive numbers, combined with some of the rhino’s more limiting characteristics – it has very poor eyesight – have added to the myth that surrounds it. Thus it was that the rhinoceros became a permanent member of the ”big five”, the roll-call of the most dangerous animals in Africa as defined by professional hunters. Such disparaging remarks aside, they were, of course, right to be worried. We have been here before when it comes to saving the rhino. In 1960, an estimated 100,000 black rhinos roamed across Africa, absent only from tropical rainforests and the Sahara. By 1981, 15,000 remained. In 1995, there were just 2410 left on the continent. In 2006, the western black rhino was declared extinct. In Kenya, the numbers of black rhino fell from 20,000 at the beginning of the 1970s to 300 within a decade. This catastrophic fall in rhino numbers was the consequence of a poaching slaughter that consumed the country’s wildlife as lucrative ivory and rhino horn was consumed to meet the growing demand in Asia; rhino horn also made its way to the Arabian Peninsula, where it was used to fashion the handles of traditional Yemeni daggers. It was in Kenya’s south, in the Tsavo National Park, that the war against rhinos reached its nadir – the park’s rhino population fell from 9000 in 1969 to less than 100 in 1980. Since then, rhino numbers have rebounded thanks to a combination of legal protection – the trade in rhino horn was declared illegal under the Convention on the International Trade in Endangered Species (CITES) in 1975 – and beefed-up security. Kenya’s population of black rhinos grew to about 600, with the continent-wide figure thought to be 10 times that number. Efforts to save the white rhino proved even more successful, with more than 20,000 in South Africa alone. A corner had been turned, it seemed, and the battle to save the rhino was counted among the great conservation success stories of our time. And then Vietnam acquired a taste for rhino horn. In 2007, 13 rhinos were killed in South Africa. In the years that followed, the rate of killing grew steadily. From 2007 to 2009, one quarter of Zimbabwe’s 800 rhinos were killed, and Botswana’s rhino population has fallen to just 38. 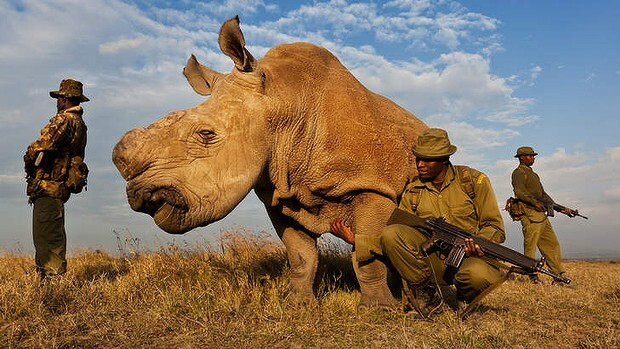 In South Africa, home to 90 per cent of the world’s white rhinos, armed guards patrol the parks. 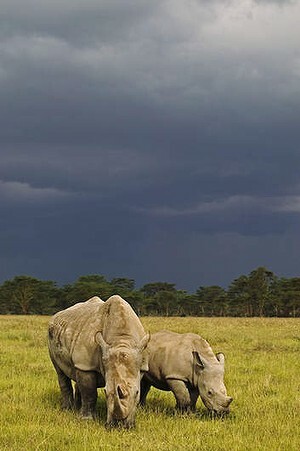 Even so, 448 rhinos were killed in 2011. The following year, the number rose to 668. In the first 65 days of 2013, poachers killed 146 rhinos. At current rates the figure for this year will be close to 830. The importance of saving Africa’s black and white rhinos is given added weight by the negligible numbers for the world’s other three surviving rhino species – the almost 3000 Indian rhinos live in highly fragmented populations, while just 220 Sumatran and fewer than 45 Javan rhinos survive. Vietnam’s last population of Javan rhinos was declared extinct in October 2011. It is proving far easier to quantify the threats faced by Africa’s rhinos than it is to arrest the decline for one simple reason: what worked in the past no longer holds. The recent upsurge in poaching has taken place in spite of the CITES regime of international legal protection. Security is also tighter than it has ever been. In South Africa’s Kruger National Park, home to almost half the world’s white rhinos, 650 rangers patrol an area the size of Israel or Wales. This falls well short of the one-ranger-per-10-square-kilometres ratio recommended by international experts, and more than 100 rhinos have already been killed in Kruger this year. Thus, those charged with saving the rhino are considering radical and hitherto unimaginable solutions. One such approach gaining traction is the controversial plan to legalise the trade in rhino horn, dehorn thousands of rhinos and flood the market with newly legal horns. Were this to happen, supporters of the proposal say, the price of rhino horn – which reached $65,000 a kilogram in 2012 – would fall, and the incentive for poaching would diminish. 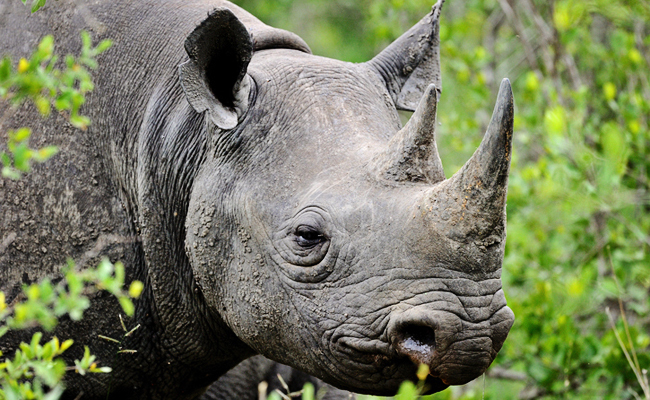 Dehorning has long been opposed by conservationists – rhinos use their horns to defend themselves and while feeding. But the failure of all other methods has convinced some that the time has come to contemplate the unthinkable. Dr Biggs and others point to the legalisation of the trade in crocodile products as an example of how such a plan could work. Critics counter that any legalisation of the trade in rhino horns is unenforceable. They also argue that lax or ineffective legal controls in Vietnam – where trading in rhino horn is already illegal – and elsewhere ensure that it will be impossible to separate legally obtained rhino horns from those supplied by poachers. The debate about saving rhinos is riddled with apparent contradictions: that we must consider disfiguring rhinos if we are to save them; that rhino numbers have not been this high in half a century but the risk of their extinction has never been greater. And so it is that the story of the rhinoceros has reached a crossroads. It is a story that pits, on one side, a creature that has adapted to everything millions of years of evolution have thrown at it, against, on the other, the humans that will either drive the species to extinction or take the difficult decisions necessary to save it.